Preparing chicken is easy as pie. Well scratch that it's a lot easier than pie. Chicken has been a long time protein mainstay in the diets of all types of athletes and that's unlikely to change anytime soon. Its a terrific protein that's cheap and easy to get a hold of. That is, unless you're Rocky. Luckily though its very easy to prepare and makes a great protein addition to a variety of different meal options. Take your chicken (1-3 pounds) and place it into a glass baking dish. Sprinkle with a pinch of salt and pepper or other spices. Depending on the cut of meat you may want to add a bit of olive oil or coconut oil. I would recommend a 1-2 table spoons if you are using boneless skinless breasts because they can get pretty dry without it. Chicken thighs (my preference) usually stay moist on their own. Bake for 45 minutes and then eat or portion out for other meals. Just add veggies and rice. Again, preheat your oven to 375 degrees. While the oven is preheating rub the bird down with a couple tablespoons of olive oil and salt and pepper. Make sure any giblets or other insides are removed and in their place input a few sprigs of your favorite herbs (rosemary, thyme, garlic, and onion are personal favorites). You can tie the legs and wings together with string, but I have made out just fine in the past without. 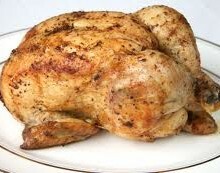 Place the chicken in a roasting pan with the breast down and roast 25-30 minutes. Flip over and roast another 75 minutes or until a meat thermometer reads 175 degrees. Remove from the oven and let the bird rest about about 10 minutes before carving. Salt and pepper only go so far and admittedly chicken can be quite boring on its own. Take some time to explore the spice aisle at your local grocer. Mrs. Dash can make your life easier, and fresh herbs will go a long way. Being from the Missouri I am a big fan of BBQ sauce and that works for me being that I am not exactly on any sort of low carb eating plan. There are however quite a sauces you can use without adding a lot of calories. I'm a huge Tapatio advocate. Side dishes can be as easy as a couple cups of various vegetables. Frozen vegetables make a very easy addition. Add the chicken to a salad mix and other veggies and you've got a one dish meal that travels easily. Place your chicken between two slices of sprouted grain bread and you've got a healthy sandwich that will rival just about anything from the usual lunch meat sandwich selections. Post your favorite ways to cook or season chicken for single meals or bulk in advance. I will likely include some slow cooker or crock pot and grilling variations in future posts.